Hans-Georg Kräusslich is an MMPU group leader and coordinator of the SFB1129. All research projects in our group address different aspects of human immunodeficiency virus (HIV) biology. A major focus in the lab is the formation and architecture of the infectious HIV particle. These studies include the development of assembly inhibitors as a potential new antiviral strategy. A related project involves the investigation of HIV protease as a target for antiviral drugs, as well as the investigation of resistance development against inhibitors of protease and reverse transcriptase. Further projects address the role of host factors for HIV entry and release. More recently, we have been employing fluorescently labelled HIV derivatives to study the dynamics of HIV-cell interactions. 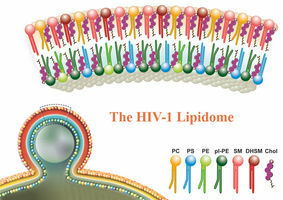 Assembly and budding of human immunodeficiency virus (HIV) is directed by the main structural polyprotein Gag and occurs at the plasma membrane of the infected cell. The virus is initially released as immature non-infectious particle consisting of mostly uncleaved Gag polyproteins. The immature virion consists of approximately 2500 Gag molecules arranged as spherical protein shell. Particle maturation occurs after proteolytic processing of Gag at five different cleavage sites, which is mediated by the virus-encoded, virion-associated protease (PR). Maturation leads to disassembly of the immature Gag layer, followed by a second assembly stage forming the mature cone-shaped capsid that incorporates the condensed viral genome associated with replication proteins. The assembly of immature particles requires only the viral Gag polyprotein and can be mimicked in vitro using bacterially expressed purified Gag-derived proteins. We have developed in vitro assembly systems to analyze the molecular architecture of capsid assemblies, to study the effect of mutations on mature and immature particle formation and identify inhibitors of HIV assembly. These studies are complemented by analyses of HIV particle formation in tissue culture. We employ structural analyses including transmission EM, cryo-EM and tomography to obtain detailed three-dimensional images of mature and immature virions, as well as viral budding sites, of wild-type and mutant HIV. These provide a better understanding of the mechanisms and protein interfaces governing assembly and maturation. The assembly process also represents an attractive target for novel antiviral drugs. Using phage display we have identified the capsid assembly inhibitor peptide CAI as an inhibitor of HIV assembly in vitro. Structural analyses revealed that CAI binds to a previously unidentified assembly interface in the capsid protein CA. Further studies are aimed at identifying the role of this interface in assembly and maturation and at identifying small molecule analogs of CAI which can serve as lead compounds for antiviral drug development. The functional role of cellular ESCRT proteins, as well as of protein ubiquitinylation and phosphorylation, for virion formation is investigated using cell biological and biochemical approaches. Furthermore, a random siRNA screening approach is directed towards identifying other cellular proteins required for HIV assembly and budding. The virus encoded protease (PR) induces HIV maturation by cleaving the viral polyproteins Gag and Gag-Pol into their functional subunits. Peptidomimetic inhibitors of PR prevent the formation of mature infectious HIV and are used as antiviral drugs for the treatment of HIV infected patients. However, resistance development limits their use. Thus, the development of alternative, structurally unrelated PR inhibitors would increase the therapeutic options. We are developing and using in vitro screening systems for the identification of novel PR inhibitors and have - together with our collaborators in Prague - described the non-peptidic carboranes as novel antiviral agents. Related studies are aimed at understanding the role of individual cleavage sites within Gag and the molecular mechanisms of resistance development against HIV PR inhibitors. Together with international collaborators from the EU project „HIV PI resistance“, we have characterized novel, substrate based resistance mechanisms, which will be the subject of further analyses. While numerous studies have yielded information on the interactions between viral proteins and cellular plasma membrane factors involved in viral entry, the dynamics of this process as well as the role of the host cell cytoskeleton are still not well understood. We have recently generated infectious fluorescent HIV derivatives, which allow the direct observation of virus-cell interactions in real time. These virus derivatives are also used to study dynamics of HIV particle formation. Furthermore, we have begun to explore high resolution fluorescence microscopy (STED, STORM) for the detailed analysis of HIV-cell interactions. A random siRNA screening approach (druggable genome), as well as several biochemical and cell biological approaches (e.g. TAP-tag purification, SILAC, automated confocal microscopy) are used to identify cellular proteins with functional roles in HIV replication. HIV is an enveloped virus, i.e. its protein capsid is surrounded by a lipid envelope, which is derived from the host cell membrane in the viral budding process. During infection of new host cells, this lipid envelope fuses to the cellular plasma membrane. Thus, lipids are involved in virus entry and egress, and they may play functional roles in viral protein composition, particle stability and infectivity. However, unlike viral proteins, viral lipids and their functional role a poorly understood. In collaboration with Britta Brügger and Felix Wieland, we have determined the lipidome of a prototype HIV using mass spectrosopy and biochemical approaches. We are currently analyzing the influence of host cells and viral proteins on the lipid compostion of the envelope and study the influence of lipid composition on the properties of the virus. Using synthetic lipid vesicles, we also want to investigate the interactions of of virions and viral proteins with lipid membranes. The largely unabated HIV pandemic in sub-saharan Africa necessitates interdisciplinary projects linking virology, immunology and public health to address HIV transmission and therapy. In the framework of SFB 544 “Control of Tropical Infectious Diseases” we have launched a prevention of mother-to-child transmission service in Nouna. In collaboration with colleagues from Nouna and Ouagadougou we also determine seroprevalence of HIV and other pathogens, analyze the genomic structure and resistance pattern of HIV, and determine normal ranges of lymphocyte subsets and response to antigen stimulation. While the majority of studies on antiviral resistance has focussed on HIV-1 subtype B, which is prevalent in Europe and the US, the vast majority of infections in sub-saharan Africa are caused by other HIV subtypes. In collaboration with researchers from Cameroon, we have generated prototype A/G-recombinant and O-type viruses, which we use to investigate potential subtype specific patterns of resistance development. Based on these results and the increasing availability of antiretroviral therapy (ART) we determine resistance patterns and study immune reconstitution and activation under ART. Hans-Georg Kräusslich, Prof. Dr. med. Mücksch F, Laketa V, Müller B, Schultz C, Kräusslich HG (2017) Synchronized HIV assembly by tunable PIP2 changes reveals PIP2 requirement for stable Gag anchoring. Elife. pii: e25287. doi: 10.7554/eLife.25287. Mattei S, Glass B, Hagen WJ, Kräusslich HG, Briggs JA. (2016). The structure and flexibility of conical HIV-1 capsids determined within intact virions. Schur FK, Obr M, Hagen WJ, Wan W, Jakobi AJ, Kirkpatrick JM, Sachse C, Kräusslich HG, Briggs JA (2016) An atomic model of HIV-1 capsid-SP1 reveals structures regulating assembly and maturation. Hanne J, Zila V, Heilemann M, Müller B, Kräusslich HG. (2016) Super-resolved insights into human immunodeficiency virus biology. FEBS Lett. 590(13):1858-76. Konvalinka, J., Kräusslich, H.G. ***, and Müller, B. (2015). Retroviral proteases and their roles in virion maturation. Virology. doi: 10.1016/j.virol.2015.03.021. Herold N, Anders-Ößwein M, Glass B, Eckhardt M, Müller B, Kräusslich HG. (2014) HIV-1 Entry in SupT1-R5, CEM-ss, and Primary CD4+ T Cells Occurs at the Plasma Membrane and Does Not Require Endocytosis. J Virol. 88:13956-70. Schur, F.K.M., Hagen, W.J.H., Rumlová, M., Ruml, T., Müller, B., Kräusslich, H.G., and Briggs, J.A.G. (2014) The structure of the immature HIV-1 capsid in intact . virus particles at 8.8 Å resolution. Nature. 2014 Nov 2. doi: 10.1038/nature13838. Izquierdo-Useros N, Lorizate M, Puertas MC, Rodriguez-Plata MT, Zangger N, Erikson E, Pino M, Erkizia I, Glass B, Clotet B, Keppler OT, Telenti A, Kräusslich HG, Martinez-Picado J. (2013) Siglec-1 is a novel dendritic cell receptor that mediates HIV-1 trans-infection through recognition of viral membrane gangliosides. PLoS Biol. 2012;10(12):e1001448. Muranyi, W., S. Malkusch, B. Müller, M. Heilemann, and H. G. Kräusslich (2013) Super-resolution Microscopy Reveals Specific Recruitment of HIV-1 Envelope Proteins to Viral Assembly Sites dependent on the Envelope C-Terminal Tail. Chojnacki J, Staudt T, Glass B, Bingen P, Engelhardt J, Anders M, Schneider J, B. M, Hell S, Kräusslich HG (2012) Maturation Dependent HIV-1 Surface Protein Redistribution Revealed by Fluorescence Nanoscopy. Science 2012, 338:524-528. Izquierdo-Useros, N., Lorizate, M., Contreras, F.X., Rodriguez-Plata, M.T., Glass, B., Erkizia, I., Prado, J.G., Casas, J., Fabrias, G., Kräusslich, H.G., et al. (2012). Sialyllactose in viral membrane gangliosides is a novel molecular recognition pattern for mature dendritic cell capture of HIV-1. PLoS biology 10, e1001315. Radestock, B., Morales, I., Rahman, S.A., Radau, S., Glass, B., Zahedi, R.P., Müller, B., and Kräusslich, H.G. (2012). Comprehensive Mutational Analysis Reveals p6Gag Phosphorylation to be Dispensable for HIV-1 Morphogenesis and Replication. Journal of virology. Geis, S., Prifert, C., Weissbrich, B., Lehners, N., Egerer, G., Eisenbach, C., Buchholz, U., Aichinger, E., Dreger, P., Neben, K., et al. (2012). Molecular Characterization of a Respiratory Syncytial Virus (RSV) Outbreak in a Hematology Unit, Heidelberg, Germany. Journal of clinical microbiology. Sundquist, W.I., and Krausslich, H.G. (2011). HIV-1 Assembly, Budding, and Maturation. Cold Spring Harbor perspectives in medicine 2, a006924. von Kleist L, Stahlschmidt W, Bulut H, Gromova K, Puchkov D, Robertson MJ, MacGregor KA, Tomlin N, Pechstein A, Chau N, Chircop M, Sakoff J, von Kries JP, Saenger W, Kräusslich HG, Shupliakov O, Robinson PJ, McCluskey A, Haucke V. (2011) Role of the clathrin terminal domain in regulating coated pit dynamics revealed by small molecule inhibition.Cell 146(3):471-84. Baumgartel, V., Ivanchenko, S., Dupont, A., Sergeev, M., Wiseman, P.W., Krausslich, H.G., Brauchle, C., Muller, B., and Lamb, D.C. 2011. Live-cell visualization of dynamics of HIV budding site interactions with an ESCRT component. Nature cell biology 13(4): 469-474. Carlson, L.A., de Marco, A., Oberwinkler, H., Habermann, A., Briggs, J.A., Krausslich, H.G., and Grunewald, K. 2010. Cryo electron tomography of native HIV-1 budding sites. PLoS pathogens 6(11): e1001173. de Marco, A., Muller, B., Glass, B., Riches, J.D., Krausslich, H.G., and Briggs, J.A. 2010. Structural analysis of HIV-1 maturation using cryo-electron tomography. 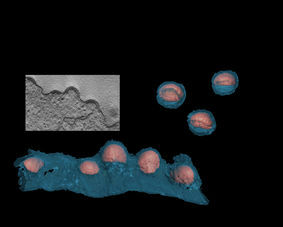 PLoS pathogens 6(11): e1001215. Habermann, A., Krijnse-Locker, J., Oberwinkler, H., Eckhardt, M., Homann, S., Andrew, A., Strebel, K., and Krausslich, H.G. 2010. CD317/tetherin is enriched in the HIV-1 envelope and downregulated from the plasma membrane upon virus infection. Journal of virology 84(9): 4646-4658. Ivanchenko, S., Godinez, W.J., Lampe, M., Krausslich, H.G., Eils, R., Rohr, K., Brauchle, C., Muller, B., and Lamb, D.C. 2009. Dynamics of HIV-1 assembly and release. PLoS pathogens 5(11): e1000652. Koch, P., Lampe, M., Godinez, W.J., Muller, B., Rohr, K., Krausslich, H.G., and Lehmann, M.J. 2009. Visualizing fusion of pseudotyped HIV-1 particles in real time by live cell microscopy. Retrovirology 6: 84. Lorizate, M., Brugger, B., Akiyama, H., Glass, B., Muller, B., Anderluh, G., Wieland, F.T., and Krausslich, H.G. 2009. Probing HIV-1 membrane liquid order by Laurdan staining reveals producer cell-dependent differences. The Journal of biological chemistry 284(33): 22238-22247. Muller, B., Anders, M., Akiyama, H., Welsch, S., Glass, B., Nikovics, K., Clavel, F., Tervo, H.M., Keppler, O.T., and Krausslich, H.G. 2009. HIV-1 Gag processing intermediates trans-dominantly interfere with HIV-1 infectivity. The Journal of biological chemistry 284(43): 29692-29703. Pongratz, C., Yazdanpanah, B., Kashkar, H., Lehmann, M.J., Krausslich, H.G., and Kronke, M. Selection of potent non-toxic inhibitory sequences from a randomized HIV-1 specific lentiviral short hairpin RNA library. PloS one 5(10): e13172. Rezacova, P., Pokorna, J., Brynda, J., Kozisek, M., Cigler, P., Lepsik, M., Fanfrlik, J., Rezac, J., Grantz Saskova, K., Sieglova, I., Plesek, J., Sicha, V., Gruner, B., Oberwinkler, H., Sedlacek, J., Krausslich, H.G., Hobza, P., Kral, V., and Konvalinka, J. 2009. Design of HIV protease inhibitors based on inorganic polyhedral metallacarboranes. Journal of medicinal chemistry 52(22): 7132-7141. Tebit, D.M., Lobritz, M., Lalonde, M., Immonen, T., Singh, K., Sarafianos, S., Herchenroder, O., Krausslich, H.G., and Arts, E.J. Divergent evolution in reverse transcriptase (RT) of HIV-1 group O and M lineages: impact on structure, fitness, and sensitivity to nonnucleoside RT inhibitors. Journal of virology 84(19): 9817-9830. Tebit, D.M., Sangare, L., Tiba, F., Saydou, Y., Makamtse, A., Somlare, H., Bado, G., Kouldiaty, B.G., Zabsonre, I., Yameogo, S.L., Sathiandee, K., Drabo, J.Y., and Krausslich, H.G. 2009. Analysis of the diversity of the HIV-1 pol gene and drug resistance associated changes among drug-naive patients in Burkina Faso. Journal of medical virology 81(10): 1691-1701. Welsch, S., Groot, F., Krausslich, H.G., Keppler, O.T., and Sattentau, Q. 2011. Architecture and Regulation of the HIV-1 Assembly and Holding Compartment in Macrophages. Journal of virology. Briggs JA, Riches JD, Glass B, Bartonova V, Zanetti G, Kräusslich HG. 2009. Structure and assembly of immature HIV. Proc Natl Acad Sci U S A. 10627:11090-5. Dam E, Quercia R, Glass B, Descamps D, Launay O, Duval X, Kräusslich HG, Hance AJ, Clavel F; ANRS 109 Study Group. 2009. Carlson LA, Briggs JA, Glass B, Riches JD, Simon MN, Johnson MC, Müller B, Grünewald K, Kräusslich HG (2008) Three-dimensional analysis of budding sites and released virus suggests a revised model for HIV-1 morphogenesis.Cell Host Microbe 4:592-9. Welsch S, Keppler OT, Habermann A, Allespach I, Krijnse-Locker J, Kräusslich HG. (2007) HIV-1 buds predominantly at the plasma membrane of primary human macrophages.PLoS Pathog. 3:e36. Briggs JA, Grünewald K, Glass B, Forster F, Kräusslich HG, Fuller SD. 2006. The Mechanism of HIV-1 core assembly: insights from three-dimensional reconstructions of authentic virions. Structure 14:15-20. Bohne J, Wodrich H and Kräusslich HG. 2005. Splicing of human immunodeficiency virus RNA is position-dependent suggesting sequential removal of introns from the 5' end. Nucleic Acids Res. 33:825-837. Tebit DM, Zekeng L, Kaptue L, Gürtler L, Fackler OT, Keppler OT, Herchenröder O, Kräusslich HG. 2004. Construction and characterization of an HIV-1 group O infectious molecular clone and analysis of vpr- and nef-negative derivatives.Virology. 326:329-339. Briggs, J. A. G., T. Wilk, R. Welker, H.-G. Kräusslich and S. D. Fuller. 2003. The structural organization of authentic HIV-1 and its core. EMBO J. 22: 1707-1715. Fehrmann, F., M. Jung, R. Zimmermann and H.-G. Kräusslich. 2003. Transport of the Intracisternal A-Type Particle Gag Polyprotein to the Endoplasmic Reticulum is Mediated by Signal Recognition Particle. J. Virol. 77: 6293-6304. Gottwein, E., J. Bodem, B. Müller, A. Schmechel, H. Zentgraf and H.-G. Kräusslich. 2003. The Mason-Pfizer Monkey Virus PPPY and PSAP Motifs Both Contribute to Virus Release. J. Virol. 77: 9474-9485.
von Schwedler, U., M. Stuchell, B. Müller, D. Ward, H.-Y. Chung, E. Morita, H. E. Wang, T. Davis, G.-P. He, D. M. Cimbora, A. Scott, H.-G. Kräusslich, J. Kaplan, S. G. Morham and W. I. Sundquist. 2003. The Protein Network of HIV Budding. Cell 114: 701-713. Weber, J., J. R. Mesters, M. Lepšík, J. Prejdová, M. Švec, J. Šponarová, P. Mlcochová, K. Skalicka, K. Stríšovský, T. Uhlíková, M. Soucek, L. Machala, M. Stanková, J. Vondrášek, T. Klimkait, H.-G. Kräusslich, R. Hilgenfeld, and J. Konvalinka. 2002. Unusual binding mode of an HIV-1 protease inhibitor explains its potency against multi-drug-resistant virus strains. J. Mol. Biol. 324: 739-754. Müller, B., T. Patschinsky, and H.-G. Kräusslich. 2002. The late domain containing protein p6 is the predominant phosphoprotein of HIV-1 particles. J. Virol. 76: 1015-1024.